Georgia claims peaches as its own, but for my money Illinois has some of the greatest fuzzy summer fruit around. Champaign-Urbana stone fruit fans will be pleased to discover a few places within roughly an hour’s drive to pick your own peaches. Note that there are several other area farms to BUY peaches, but you-pick is a little more rare for peaches, at least in Central Illinois. Right now, we have only two places listed below. In Central Illinois, peach season generally starts in late July and goes through mid-August. To be sure that there are peaches ripe for the picking, we recommend that you call ahead before you go to any farm (some also put up information on their Facebook pages and/or websites). Some farms have limited quantities, and the seasons can be short. 1) Be sure to bring plenty of sunscreen; sunglasses and hats are also helpful. While there is more shade in a peach tree orchard, it’s season is during the height of summer. 2) Where there is fruit there is often bugs. Go early in the day as possible; be prepared to do sunscreen and bug repellent. 3) Remember that peaches are heavier than berries, so bring a wagon if you can. 4) Watch the weather. You don’t want to be picking with any threats of lightning. 5) Remember, picking season is short! Best known for goats milk products such as cheese, our friends at Prairie Fruits Farm offer peaches for picking, but pay close attention to their instructions. From their website: “Red Havens, Reliance, Harrow’s Beauty are the three red-yellow peach varieties for picking in late July through mid August. Belle of Georia,a white variety, might be available for picking in late August as well as Elberta peaches-a real old time variety.” Posted Price: $1.75/pound. Location: Unincorporated north Champaign, off of Lincoln Avenue. Notes: In the past, U Pick Hours were on Wednesdays from 4-6PM (during our farm open house). It’s unclear yet if that’s the case in 2017. Our family went to Jeffries Orchard in Springfield last summer, and you can read all about this no-frills experience on the website. They have a roadside stand and sell produce all summer long, offering multiple pick-your-own fruits including strawberries, blueberries and peaches. White peaches ripen first and are typically available in late July while yellow peaches are available in August. Location: A great advantage for this place: it is close to Springfield and therefore close to other attractions, food, etc. About 75 minutes from southwest Champaign. Notes: Open 7 days a week. Takes credit cards. Posts regular updates on its Facebook page. 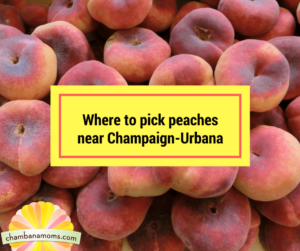 Did we miss your favorite peach u pick near Champaign-Urbana?